It was the spring of 1986. Once again we were visiting England for several weeks of ministry in various churches that had invited us to come. My wife, Paula, our (then) fifteen-year-old son, Bryan, and myself were driving in London’s notorious traffic. We were not far from Buckingham Palace. We had stopped for a red light at one of those odd intersections where five different streets converge. As we waited, we noticed something out of the ordinary. We saw that all the other car occupants around us were staring at it, too. Many of them were smiling, and all of them appeared fascinated. In fact, all the cars at that intersection had stopped, including the ones that had a green light and should have been moving! What was the grand event that demanded such awe, such courtesy and decorum? Straight in front of us, a mother duck was waddling across the intersection with her eight newly hatched chicks scampering behind her. However, no one seemed impatient for having to wait as this mundane yet heart-warming scene unfolded. Not one horn sounded. Not one irate voice was heard, shouting, “Hey, what’s the holdup! ?” (The English love animals, and so do we Slagles.) Everyone was enthralled, mellowed out to the max. It was obvious they were thoroughly enjoying this unusual interruption to their busy schedules. At last the mother duck reached the curb on the far side of the intersection. With a single hop she scaled it and headed to the right, toward the cool green shade of a nearby park. One by one, her brood followed suit. With one or two bounds they each cleared the curb and turned to the right and followed their mother. However, the last duckling, which was also the tiniest, was not so fortunate. When it reached the curb, it strained and jumped and strained and jumped, but to no avail. The wee creature was just too small to leap atop the eight inches of concrete precipice that rose before it. Even so, it tried and tried and tried. Meantime, the mother duck waddled on with her youngsters close behind. All of them were oblivious to the plight of the smallest one. So while the struggling chick kept leaping in desperation, the distance between itself and its family widened and widened. “I’ll be right back!” our son announced with a determined grin. Then he opened the van door and sprang out. “Be careful, Bryan!” Paula shouted after him. But she need not have worried. Not one of those cars waiting at that intersection was going anywhere. 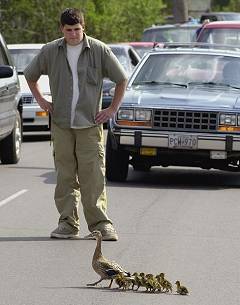 As our teenage hero sprinted across the asphalt he was only doing what everyone else was trying to figure out how to do — rescue the abandoned duckling. In just a few seconds he was there. He gently scooped up the struggling chick in both hands and placed it on top of the curb. And off it went as fast as its tiny legs could scurry to catch up with its mother and siblings. Our son turned with a smile of jubilation and ran back to rejoin us in the van — amidst the applause of perfect strangers. And yet, for a brief moment, all of the smiling people gathered with us at that intersection were not strangers to us, nor were we strangers to them. Our hearts were joined. All of us were friends. Why was this? I think it was simple and childlike compassion that had joined us. Tenderheartedness for one of God’s tiny creatures had put all of us back in touch with who we really are — human beings, brothers and sisters, the offspring of our Creator, made in His image. Who knows? There may have been some IRA extremists among the car occupants and pedestrians who met at that crossing in cosmopolitan London. For obvious reasons, I know there were some Americans. Only God knows the ethnic and cultural backgrounds of all the people who found themselves congregated there. However, at that brief moment no one cared. All of us cared only about one thing: rescuing a baby duck so it could reunite with its family. We human beings have far more in common with the One who created us than we realize. He sees every duckling that struggles and every sparrow that falls. His heart yearns after the lost and struggling among His human family. We human beings have far more in common with the One who created us than we realize. He sees every duckling that struggles and every sparrow that falls. His heart yearns after the lost and struggling among His human family. The original language of Ephesians 3:14 tells us that “every family” in Heaven and earth is named after our Good Father. So we see that the Bible definitely reveals Him as being a family-oriented Parent. God has brought wonderful healing, but Paula and I experienced that kind of abuse years ago. In fact, when I was growing up, all that my dear family knew was harsh legalism that called itself “the gospel.” Bad news that called itself “good news.” So we know by experience that there is nothing that hurts more than to look trustingly to one’s fellow Christians for healing prayer, counsel, deliverance and encouragement, but in return, only to receive judgment, threats — and betrayal. When you feel like the smallest and weakest ducking in the litter, and you are jumping and scrambling with all of your might to clear impossible hurdles, what you do not need is someone in your face telling you what a lousy wimp you are! Right? And being told, “Unless you get your act together, God’s out of here!” hardly serves to strengthen your heart bonding with Him! Maybe you feel like you are the littlest, loneliest duck in London. Perhaps, not only the littlest and loneliest, but the ugliest one in the whole world! Do you feel hopeless, disoriented — lost? Perhaps religion has programmed you with the satanic lie, “You can count on God, IF He can count on you.” In other words, you may have been programmed to believe that God is only as reliable as you are — that the Lord will not help you unless you sort yourself out. If an abusive church environment has trained you to beat up on yourself, you are not alone! When Jesus showed up 2,000 thousand years ago in the midst of the Israeli “church”, He knew they had lost touch with God’s heart, not only for the world, but also for themselves. So He didn’t limit Himself to appealing to their compassion for their fellow human beings, for many of them had lost touch with that kind of natural empathy. They had lost touch with the most basic and elementary understanding of God’s true heart. Did you notice that our Good Shepherd looks for His lost sheep until He finds it? That is the point of that little story. It is about the Shepherd Who goes and looks for His lost sheep until He finds it. It is not about the lost sheep that searches for its (lost?) Good Shepherd until it finds Him. Our good Shepherd remains faithful to those “lost sheep and ducklings” who are last, just as He does to those who are first. He said that many who are last shall be first, and many who first shall be last. But, thank God, last does not mean “never”! This being true, our good Shepherd remains faithful to those “lost sheep and ducklings” who are last, just as He does to those who are first. He said that many who are last shall be first, and many who first shall be last. But, thank God, last does not mean “never”! If you are hanging on for deliverance by bleeding fingernails, or perhaps, you have already gone past that stage and dropped to the bottom and are in total despair — we Slagles have been there. We know about ecclesiastical abuse and treachery. We know about self-hatred and self-condemnation. We know about darkest despair. But we also know about a Strong Deliverer Who suddenly breaks through and illuminates our darkness — even when we’re doing nothing right — and grants us miraculous turn-around. Since deliverance came to us by Love’s Astonishing Grace, we are not offering 666 easy steps to follow in order to solve your problem. We have no programs or strategies to share. But we do have SOLID HOPE for you, because we know — by experience — that our Heavenly Father is faithful. Again it has been My delight to hold you close, whisper My secrets in your ear, and joy in the wonder of you. I know. There are still some areas We both want to see healed, but those little pockets of pain have been inside you a very long time. And believe it or not, as troublesome as they are, to remove them all at once would be unwise. Through the years little by little and deep within yourself, you came to think of those inner hurts as a part of your identity. As a Wise Masterbuilder I simply know that to replace those faulty parts with the original ones I designed for you does require a certain pace and process. Why? You are always asking why, aren’t you? But I have already told you! To heal those inner wounds in a single act of My power would deny you the opportunity to grow, to know by experience, and thereby to become a compassionate deliverer. There are some kinds of knowing that only come by growing — otherwise why should My Son have arrived in your world as a baby? Jesus Himself learned obedience — sinless though He was — by the things He suffered. Not even He was exempt. To fulfill all righteousness and lay hold of deepest wisdom, even Almighty God had to embrace pain and death. Christ’s baptism into suffering and death has become your baptism into glory and life. How so!? HA! Shall I send you a blueprint of the cosmos for starters? The full explanation lies beyond the range of mortal comprehension. At least, such is My view of the matter. Trust Me! Do you have any other choice? If you were trying to live two lifestyles — if you were justifying sin or seeking to harm another — that would be different. Then I would be forced to let you feel the full impact of your ways. I would laugh at your reasonings, ignore your pretended prayers and weep for your delusion. But such is not the case. I told you this earlier, but I will tell you again; I have seen your tears and heard your cries. I AM holding you now. Don’t give up. I haven’t. Your sacrifices of praise and even your outbursts of frustration are all part of a two-fold process. You are experiencing the death throes of the old and the birth pains of the new, and there just is no other way for this deliverance to come forth. Soon you’ll not even think to question the process. You’ll be too busy enjoying the substance born of the process. Heavenly Father, I ask that you will cause these words to “zing home” to the hearts of Your hurting children. Please cause them to hope again. Your Word assures us that when we were without strength, Christ died for us. Your word also tells us that none of us can seek or come to You, unless Your Spirit draws us. That means that even our coming and our seeking You is actually Your Spirit leading us into the Healing Light of Your Presence. So please confirm to every searching heart that is receiving this message that You are working — even now — to bring about a total and glorious deliverance and that our Good Shepherd will prove Himself faithful. Father, we forgive those who have abused us with the lie of conditional love, especially those who have even done it in Your name. Please forgive them. They didn’t know what they were doing. They only gave what they had. So we ask that You will bless them for being faithful to impart what they did have. We also pray that You will reveal Your good heart to them in ways that heal them. We ask that You will cause them to become some of Heaven’s most powerful healing agents in this world of darkness and pain. Dear Father, in our ignorance we have also abused and trashed ourselves. When Christ was being nailed to the cross He prayed, “Father forgive them, for they know not what they do.” Your Savior-Son has always done those things that are pleasing in Your eyes. So according to Your promise, You answered His prayer and forgave us. Thank you for helping us now to forgive ourselves. Help us to walk away from the past so we can experience the astonishing joys You have set before us.